Admit it: On more than one occasion, you've said to yourself, I'm going to quit work and start my own bed and breakfast/wine bar/restaurant. Danielle Lewis and Michael Goldberg got sick of saying it, so they decided to finally do it. The result is Rochester's newest foodie attraction: Chocolate & Vines, located in a renovated house in the Neighborhood of the Arts. Lewis and Goldberg bought the house nearly two years ago and spent 18 months renovating it. They live upstairs, with the downstairs converted into a chic mini-restaurant with seating for roughly two dozen customers. The menu features wine, cheese, artisan chocolates, desserts, craft beers and French-press coffee. We noticed that the top of each wine section features a New York state selection. It turns out that's not an accident. "We wanted to place New York wine right at the top to make sure our customers know there are local choices," Danielle told me after a satisfying two-hour tour of the menu. "We've had so much fun putting the wine list together, and we wanted our customers to have fun deciding what to order." Here's the menu, which is not fully updated -- it doesn't show the by-the-glass McGregor Black Russian Red, which I ordered and is shown in the photo ($15.50 for a glass of Black Russian paired with an artisan chocolate). It's the only time I've ever seen this cult-ish Finger Lakes red offered by-the-glass. 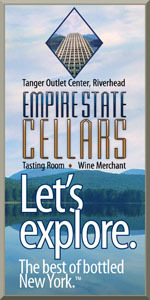 There is much more from New York state, though it's a wine list to suit worldwide taste. 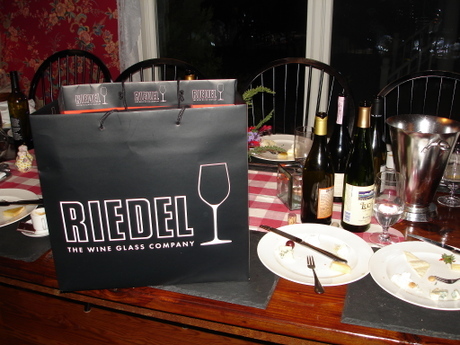 Long Island's Bedell Merlot headlines the red list. Whites from Hermann J. Wiemer, Prejean and other Finger Lakes producers headline the whites. A friend ordered a glass of Argentinian Malbec while I pondered a glass of Masi Amarone, ultimately saving it for my next visit, which will also include one of the 18 craft beers on the list. There is even a pair of Finger Lakes meads available. A visit to Chocolate & Vines nearly requires a taste of the artisan chocolates, so our party sampled the almond marizpan, passion fruit, cookies and cream, and dark chocolate truffle. Even more enjoyable was the range of cheeses on offer, from simple aged gouda to a carmelized Norwegian Gjestost. There is a room adjoining the dining area that provides a pool table, but I'm not sure it fits. The dining area was packed and buzzing on a Saturday night and the unused pool table made me wonder if that's a space better suited for more dining. For now, Chocolate & Vines is open seven days a week, noon to 11pm. Lewis expects that to change eventually, "But for now we want to be always open, always available. We want to build a customer base and introduce ourselves." They're off to an excellent start. You drive down lake roads this time of year and I know what you're thinking. The sunflowers appear to be slumped over, bowing their heads and mourning the death of summer. It's important to remember that they're only weighed down by seeds. New life. Harvest is here. Perhaps you've attended a harvest dinner before, but I'd guess you've never attended a harvest dinner that pairs locally grown food with a full flight of... beer? Yes, beer, for the entire evening. "Beer fanatics are already excited about this one," says Liz Karabinakis, the community food educator who has been working with Cooperative Extension of Tompkins County to plan a series of diverse havest dinners. "They'll be pouring specialty brews, and even though I'm a wine lover, it got my attention!" That's the idea behind the Healthy Food For All harvest dinner series. Each event costs $75 per person, and Karabinakis says the organizers have tried to vary the themes. "There's so much food, wine and beer to showcase that we wanted to give people a chance to attend multiple farms and not feel like it's the same thing at each event." The beer-themed harvest dinner will be hosted by West Haven Farm in Ithaca on November 8. But while beer gets the spotlight for one night, local wines are appearing more often at these events, with wines from Bet the Farm and Hosmer on future menus. There is something purely invigorating about dining al fresco, surrounded by vines and chickens and rows of vegetables just waiting to be harvested. On Sunday night we were part of a sold-out harvest dinner at Sweet Land Farm in Trumansburg, where Vinny and Kim Aliperti of Atwater Estate Vineyards and Billsboro Winery poured some of their best. And with no cloud cover to offer a blanket of insulation, the first whispers of fall only added to the elysian ambiance. "Vine dining is building in popularity over the past several years," Karabinakis says. "In fact, we model some of our events directly from the Atwater event that they host. If we can sit outside among the vines, we love to do it. And while not every farm has vines, the concept stays true when we're dining just a few steps from where the food was harvested literally that morning." The menu was thoughtful, the wine refreshing. I was surprised to find that my favorite was the chicken liver toast with fig jam, though I also loved the celario-apple salad that accompanied the local roast pork. We joined Evangeline Sarat for a farm tour -- and, as you can see in the picture on the right, she demonstrated just how fresh the food for that evening was. While I enjoyed seeing her rip food straight from the earth, my wife marveled at the backpack that carried her budding farmer baby. Most harvest dinners will include optional tours, and Karabinakis says guests will have a chance to see more than just the farms. She points out that for the upcoming October 11 dinner at Stick and Stone Farm in Ithaca, guests can tour Regional Access right next door. Regional Access has built a distribution system that allows local chefs to use more local food. With many farms participating in community supported agriculture (CSA), guests have a chance to learn about what it means to buy into a CSA. At Sweet Land Farm, members operate on an honor system when they come to pick up food. A sign instructs members to "take only what you need," and they're also free to pick fruits on their own. The Healthy Food For All series of dinners has three events remaining this season, with the first coming this Sunday. Karabinakis says that while past events have sold out, there is some ticket availability. But you're better off calling to inquire as early as possible to make sure you're not shut out. Other farms and wineries are holding events on their own. It's a time of year to remember: There is life in the fields. Harvest is here, and local farmers are joining winemakers and brewmasters to share their stories. I Met My Farmer Last Week. Have You Met Yours? Let me start by saying that I love animals, but I also love to eat them. I appreciate the dichotomy of finding cows lovable and delicious. I am nauseated by the horrific treatment of cows, pigs and chickens, among other animals, but it's always been easiest to simply not think about such treatment. This week that abrogation of duty ended for me. On a crisp but sunny afternoon I drove down to Romulus (located between Seneca and Cayuga lakes) to meet Tim Haws, the farmer and owner of Autumn's Harvest Farm. It was not a convenient time for Tim, as he was juggling myriad duties on the farm (cows getting ready to give birth and food needing to be delivered to local restaurants, for example) and myriad duties in the small house connected to some of his 77 acres (taking care of his 18-month old son and 3-month old daughter, for example). And yet Tim had encouraged me to come down and see the animals, so I did. I had discovered Autumn's Harvest Farm on EatWild.com, a wonderful resource devoted to linking consumers to grass-fed beef, pastured eggs, etc. And yet I confess that I still harbored doubts. A stunning majority of food sold in grocery stores (even stores like Whole Foods) does not boast an origin that matches the flowery stories printed on the labels. American farmers struggle to survive if they do not adopt an industrialized model -- the government, and the USDA in particular, favors larger producers and subsidize the operations that submit to this model. I have not met many farmers who have refused to submit to this scheme. "Our animals are happy. Believe me, that matters." "We rotate our cows at least once a day, and sometimes twice. They're so smart. They not only know they're going to be moved, they get excited about the new grasses." "Cows are not supposed to eat corn. And don't believe they're only eating corn on those huge farms. They get fed dried bubble gum and all kinds of trash. That's disgusting, and then you think about eating that cow that was eating that stuff." This was not a sell job. He did not have a set shtick designed to placate consumers who want to eat some Elysian version of "organic." He was just plain-spoken and he was, no doubt, speaking my language. I was already sold on Tim's practices, and I was deeply enjoying having the chance to meet his family. I offered to write the check for the food I was buying (a 14-pound ham and a pair of steaks -- Tim threw in some extras as a gift), and I wanted to get out if his hair. His father, who takes care of a lot of the delivery, was getting ready to head out to Red Newt Bistro and several places -- Autumn's Harvest provides beef and pork to Red Newt, Simply Red at Sheldrake Point, and a handful of other restaurants. But Tim didn't want me to leave before I met some of the animals. We took a nice walk around the property and said hello to some of the heritage pigs and cows who were lazily chomping away at the grass. Tim showed me one of the portable pens that allows chickens to move around on the grass -- real, actual free range! -- and he continued to cheerfully talk about the benefits of animals eating grass. "Chickens don't only eat grass," he said, smiling. "They love to follow the cows and dig through the cow droppings to find the bugs. We don't ever have to spray -- the chickens do so much work!" It was, to be sure, a mirror image of the philosophy espoused by the now-famous Joel Salatin in Michael Pollan's brilliant book, The Omnivore's Dilemma. And yet I had never mentioned Salatin or Pollan or the book. Tim was leading me around, sharing his own ideas, and it only reinforced the importance of grass-fed animals. At the risk of sounding condescending, I can't urge you strongly enough to go meet your farmer. I will make a strong effort to never buy corn-fed beef again unless there are no other options. If we could see the way most of the animals that we eat are treated, we'd find those farmers and ask them how in the world our food system ever devolved into this madness. And then if we could meet people like Tim Haws, we'd be inspired that it can change. There are other grass-fed farms in the Finger Lakes and Long Island -- and across the state and country. Check out EatWild.com to find them. And share your stories in the comments. Before I left I asked Tim and his father if I could come back later this year and volunteer for a day. Tim laughed, and his father said, "You better be ready to get dirty!" I am ready indeed, though I know that "dirty" at Autumn's Harvest Farm carries an entirely different meaning than dirty at an industrialized facility. Knives will be gleaming, pots and pans heated up to the boiling point and only one culinary warrior will remain at the end of the night at the Rochester Food Fight tonight. Representing the Finger Lakes in this fast-paced battle of four chefs is Debra Whiting, executive chef and co-owner of Red Newt Cellars Winery and Bistro on Seneca Lake. Debra is a local culinary celebrity and has garnered recognition from publications such as Food and Wine Magazine, Nation's Restaurant News and the Wine Spectator. Of the event, Debra said, "I'm very excited about the Rochester Food Fight and I think it's a great idea. It's something I haven't done before, so it's new territory for me. It will be interesting because there are 10-minute rounds. Representing Red Newt are myself and my sous chef, Wayne Cox. We're excited about it and looking forward to it. We hope a lot of people are there to support not only Red Newt, but the other chefs as well." The event takes place from 6 to 9 p.m. tonight at the Main Street Armory, 900 East Main Street in Rochester. The event will also feature a tasting component. 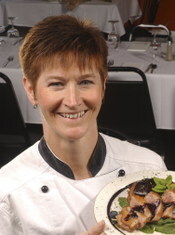 The other culinary contenders include John Frezee of Erie Grill at the Renaissance, Del Monte Lodge and Spa (Pittsford, NY), Eric Mueller of Warfield's Restaurant (Clifton Springs, NY) and Art Rogers of Lento (Rochester, NY) For ticket information, visit http://rochesterfoodfight.org/tickets.html. As soon as we booked our trip to Keuka Lake, I started asking around for restaurant recommendations. They came from far and wide, but one of the first ones came from Lisa Hallgren, co-owner of Ravines Wine Cellars. 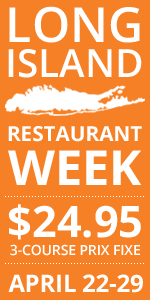 She recommended Snug Harbor Restaurant & Inn, so I made a reservation for our first night there. What a great find in the region's off season. If they had been open on Monday, we would have gone back. From the location, to the service, to the food, it was one of the best experiences we've had in a long time. We felt more than comfortable with Jackson (this is by far the nicest restaurant he's been to) and the heavily local wine list was impressive. Jackson's macaroni and cheese was so good that we ate some of it too. The only thing that wasn't spot on was Nena's tilapia, which was just okay compared to the rest of her entree. But our salads were fresh, well balanced and flavorful. My Thai curry noodles were great (though they could have been spicier) and the banana creme de caramel was terrific. Soon, I'll tell you about our worst meal in the Finger Lakes (and maybe ever), but let's stick with the positives today. I'd recommend Snug Harbor to anyone.